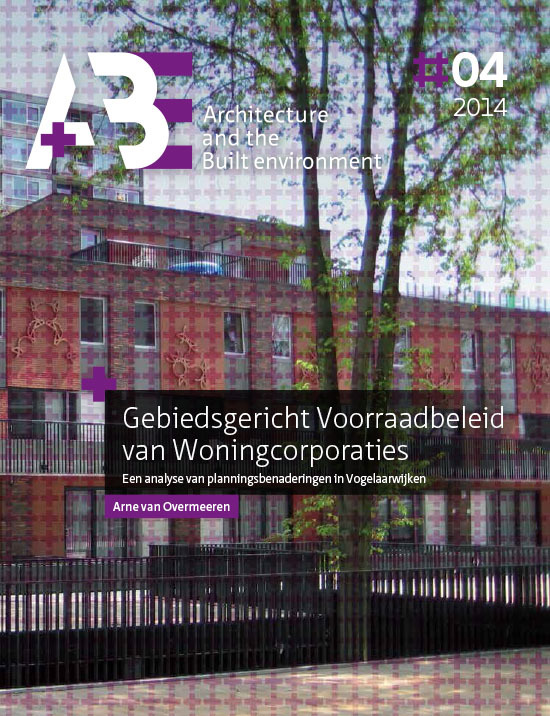 This thesis focuses on area-based asset management of housing associations. In this thesis you can find out how housing associations establish coherent intentions regarding the housing stock in neighborhoods and what planning approaches they are using. Since their independence in the nineties of the last century housing associations have developed to social enterprises that are committed to a broad field of activity. This change allows for increased complexity of decision-making on the housing stock of the housing associations. The asset management of housing associations has changed from a policy that focuses on the physical pillar (homes), on the primary target group and on its own portfolio , to an area-based asset management that is characterized by cooperation with other parties, by the broadening to social and economic activities and by a (policy) distinction between different areas. The traditional asset management models are often not adapted to this development. These models do not take sufficient account of area characteristics, by which the proposed measures do not necessarily fit the area-specific problems . In addition, the policy is difficult to implement, because the top-down approach of the models neglects the reality in which multiple, interdependent actors are needed to have a successfull housing stock policy. That is why in this thesis it is examined which planning approaches housing associations use in the formulation of area-based asset management in restructuring districts (Vogelaarwijken). First a theoretical framework was formulated, based on a literature review. This framework was then tested in a pilot case (Woonplus Schiedam). The literature review and the pilot case resulted in five suppositions, which were tested in a survey and in two case studies (Com•wonen and de Alliantie). Area-based asset management is defined in this thesis as the set of interrelated intentions of housing associations for activities regarding the housing stock within an area, which is partly based on the physical, social and economic characteristics of the area where the stock is located, which has been prepared in cooperation with stakeholders (or at least is taking into account stakeholders) and which is in connection with other activities, with the aim to increase the quality of the area. In this research area-based asset management is considered a form of planning. Planning is a process that is about the future improvement of the living conditions in areas. It is a goal-oriented process in which actors undertake planning activities based on knowledge. The area-based asset management can be achieved by using different planning approaches. The literature review resulted in five planning approaches to describe the process of area-based asset management: rational planning, incremental planning, political planning, collaborative planning and social movement planning. These approaches differ on the following elements: actors, use of knowledge, activities and objective. With these elements, the area-based asset management process of housing associations can be described. These approaches have different strengths and weaknesses, which can contribute to the area-based asset management process positively and negatively. This contribution can be compared using the following criteria: feasibility, action potential, substantive theory, public interest, human dimension and self-reflective (Hudson et al., 1979). Feasibility relates to the feasibility of the process. The process should lead to policy implications and should be able to adapt to different situations. Action potential means that the process includes conditions that contribute to the implementation of the policy. Substantive theory means that the planning process should be consistent with the substantive issues and should make use of substantive theories and knowledge. In the public interest criterion the question is whether a planning approach has explicit methods to deal with different interests and to recognize conflicting interests and societal problems. Human dimension is about the attention for subjective considerations and implications of planning, for example for personal, psychological, ideological, political and cultural considerations and consequences. Finally, selfreflective concerns the room a process provides for reflection and criticism. In this thesis the housing association is understood as a social enterprise. Social enterprises are organizations that are designed as private entities and operate in a market situation, that simultaneously use their resources to pursue a societal goal that is intertwined with (or is partially parallel to) the public interest, that produces goods and services and which financial surplus or profit is not distributed, but is fully utilized to achieve the social goal that they pursue (Toonen et al., 2003; Wetenschappelijk Instituut voor het CDA, 2005). show a great responsibility for the outcomes of their activities to the groups they serve. 1. Area-based asset management of housing associations is the result of a mixture of planning approaches and elements. By applying a mixture of planning approaches, it is possible to make a positive contribution on multiple criteria. Supposition 1 was confirmed in the pilot case. The case showed that the five planning approaches studied in this thesis were used within the restructuring district Nieuwland over the years. Also the survey, aiming to get an overview of the way housing associations in restructuring districts get to their (proposed) housing stock activities, confirmed this. The two case studies supported this supposition. All elements of the planning approaches were distinguished in the asset management process in the districts Indische Buurt and Oude Noorden. In the various stages of the process different planning approaches and elements were dominant. For example, a weak property of the rational approach, dealing with multiple interests (see section 2.2), was compensated by involving multiple stakeholders (collaborative element) in drafting both the asset management plan of Indische Buurt as the development vision of Oude Noorden. 2. Area-based asset management of housing associations is mainly the result of a rational and collaborative planning approach. The survey revealed that elements of the rational and collaborative approach often occur. The least often activities resulted from social movement and political elements. In the two cases studied also the rational and collaborative elements often emerged. In the period of preparing the asset management plan the focus of de Alliantie was on rational elements. In the periods in which de Alliantie negotiated on covenants the emphasis was on collaborative planning, but also the political approach was relevant. In the phase of implementation of the asset management plan all approaches except the political played a part. In the Com•wonen case the emphasis was, in the period of preparation of the plan, on political, collaborative and rational elements. In the implementation phase, the focus was on incremental elements, and in the preparation of the asset management plan on rational elements. During the period that a joint structure was established, externally there were collaborative and incremental elements involved. There were also political elements recognizable. Internally, it was mainly a matter of collaborative elements. 3. The planning approaches respond to each other. The planning approach that is followed is influenced by the preceding planning approach. In the cases this assumption was confirmed. In both cases, social movement planning was followed by collaborative planning. At Com•wonen a squat led to consultation and at de Alliantie protest led to the introduction of residents platforms. Also in both cases incremental planning followed rational planning. At de Alliantie the rationally drawn asset management plan was reassessed and updated incrementally at the project level. At Com•wonen the asset management plan that was formulated in 2006 was reassessed twice in incremental label sessions. 4. The emphasis of approaches shifts in the course of time. This supposition was also confirmed in the cases. In the cases different phases can be distinguished in which different planning approaches predominate. The phase in which an area plan was drawn up can be distinguished from the phase in which the focus was on the implementation of this plan and the phase in which other parties were involved into the planning process. The phase in which the process is located , also seems to affect the planning approach that is used. The predominantly rational plan is followed by a political process of negotiation after which the process develops, through incremental planning, in a collaborative direction. Social movement planning is rare, but when it occurs it is reason to change the process. At de Alliantie the rational preparation of the asset management plan was followed by political negotiations that led to the first covenant. Then implementation took place in an incremental and collaborative process. The plans were modified in consultation with residents. At Com•wonen the development vision (and the resulting area agreement) was a result of both a rational and political process. Then there was an incremental phase of implementation that led to a collaborative structure. 5. Developments in the context of housing affect the planning approach that uses the housing. This assumption was confirmed in the two cases studied. It was clear that housing associations could not choose a planning approach just like that. The choice of a planning approach is influenced by contextual factors outside the housing association. These can be institutional factors, such as the presence, characteristics and attitudes of the actors. In the Indische Buurt for example, the residents were not organized in the early stages of the process. In the Ouden Noorden fellow associations did not participate in a joint plan by which there could be no collaborative planning. In addition, the complexity, nature and scale of the task differs. For example, at de Alliantie, the interventions were focused on the “preservation and restoration” of 1700 homes. At Com•wonen the emphasis was on creating a nice shopping street. Also the housing market is different in both contexts. In Amsterdam, the housing market is significantly tighter than in Rotterdam. Specific events may also have an impact on the planning approach. Protests from residents resulted in the Indische Buurt in adjustment of the process. In the Oude Noorden the poor economic situation of the businessmen in the shopping street was the reason for housing associations PWS and Com•wonen to join forces and launch a collaborative process. Housing associations themselves also have an influence on the planning process, for example by taking the initiative, assuming a certain position, forming a vision, mobilizing resources and through the organization of their association. For example, de Alliantie took the initiative to independently set up a worked out plan. She also has adopted an open/flexible attitude by not handling the plan as a blueprint, but as a direction. Com•wonen displaced for example the community development section to the Real Estate department, which made the planning process more consistent. Developing an asset management plan in 2006 was a step towards rational planning. With the abandoning of this plan the process became more incremental. In the figure above, above factors that have influence on the planning approach are shown schematically. The strengths and weaknesses of the planning approach in this thesis are tested on the following criteria: public interest, human dimension, feasibility, action potential, substantive theory and self-reflective (Hudson et al., 1979). For each criterion is examined in the case studies which (positive or negative) impact a particular planning approach has on the process and whether it matches the expectation based on the theory. The expectation was that collaborative planning would positivily contribute to the public interest criterion. This seems to be confirmed in the cases. At Com•wonen the internal planning team monitored the public interest because in the team any “interest” was represented. Externally the process manager took care of the connection of interests and safeguarding the public interest. The positive contribution that was expected by political planning is confirmed. At de Alliantie it was shown how political planning can contribute to the public interest. In the negotiations for the first covenant de Alliantie contributed to the public interest (for example, the behind-the-door approach) as to bring negotiations further. The expectation was that collaborative planning is a positive contribution to the criterion of human dimension. The findings of the case studies support this. For example, participation in the context of the development vision at Com•wonen and the residents platforms and home visits at the de Alliantie case. The expected positive contribution of social movement planning is also reflected in the cases. Social movement planning in the form of squatting a property of Com•wonen and in the form of residents protest at de Alliantie following the first experimental projects. Based on the theory, a low feasibility of the collaborative approach was expected because of the multitude of parties. This is consistent with what was found in the case studies. However, at the Com•wonen case there were collaborative elements that had a positive impact on the feasibility criterion. The use of a shared vision and the commitment of an independent process manager who was responsible for the process contributed to the feasibility of the process. The expectation in the rational approach was not univocal. On the one hand, the rational approach uses a simple linear model, on the other hand the claim to be comprehensive makes the approach complex. The cases showed that that the independent top-down approach of de Alliantie and the use of process manual by Com•wonen had a positive impact on feasibility. Both factors are elaborations of the simple linear model. The expectation was that the incremental approach had a positive impact on the feasibility criterion. At Com•wonen this positive influence was apparent that plans were elaborations of existing plans. Also the lack of strong overarching frameworks with clear goals, characteristic of the incremental approach, contributed to the performance on the criterion of feasibility, because there was plenty of room for the area-based completion of the plan. The expectation was that collaborative planning would contribute negatively to the criterion action potential. However, in the Com•wonen case collaborative elements also contributed to the action potential of the plans. Subsidies created external pressure to proceed to implementation and intensive cooperation prevented stagnation when there was friction. Incremental planning was expected to contribute to the action potential of the policy. A realistic final image (target), associated with the incremental approach, contributed to the action potential in the Com•wonen case. On the substantive theory criterion a negative contribution was expected from the rational, incremental and political approach. The expected contribution of the collaborative and the social movement planning approach was not clear. In the cases no relation was found between the approach practised and the substantive theory criterion. The expectation was that the rational approach would contribute negatively on the criterion of self-reflective. However, at de Alliantie the experiments with the labeling (rational planning) contributed to the reflectivity of the process. The expectation was that the incremental approach would not be reflective. Yet, the Com•wonen case showed that the reassessment of the area agreements from 2004 resulted in the reflective capacity of the process of Com•wonen. This reassessment fits the incremental approach. Housing associations must be proficient in several approaches. Tune the approach to the local context and organization. Tune the approach to the phase where the process is in. Pay more attention to the substantive aspects of planning (substantive theory). Provide for sufficient flexibility within the frameworks of the overall portfolio policy. With the results of this study housing associations can gain a better understanding of their asset management process and they can adjust the process so that they can make better-informed decisions regarding their housing stock. This allows them to execute their societal tasks more effectively and efficiently.